The Junior Auxiliary of Yazoo City in conjunction with the Yazoo Arts Council will present New Stage Theatre Arts-in-Education Touring Program’s production of The Celebrated Jumping Frog of Calaveras County from the story by Mark Twain, adapted by Joseph McDonough. About: The Celebrated Jumping Frog of Calaveras County is the original short story that made Mark Twain famous! In this lively leaping stage adaptation this classic story comes to life as we explore the themes of honesty, transparency, and following the golden rule! Jim Smiley has built quite the reputation as a betting man. He will bet on everything from a horse race to a chicken race and anything in between! If you let him, before you know it he will have you gambling with the very shoes on your feet! What happens when Jim’s “good luck” comes abruptly to an end? Audiences will experience first-hand the importance of being honest, showing kindness and a gentle reminder to treat others the way you would like to be treated! *The Celebrated Jumping Frog of Calaveras County is best suited for elementary school audiences. Tickets $15, available at select local retailers. Click here for more information. Featuring LIVE Music, Arts & Crafts, Antique & Classic Car Show, Kidz Zone fun, Silent Auction, Food Vendors, Talent Contest, Jerry Clower Impersonator Contest, Hula Hoop Contest, Magically Perfect Princesses, and more! This event takes place on colorful and historic Main Street in Yazoo City. Admission is FREE!! 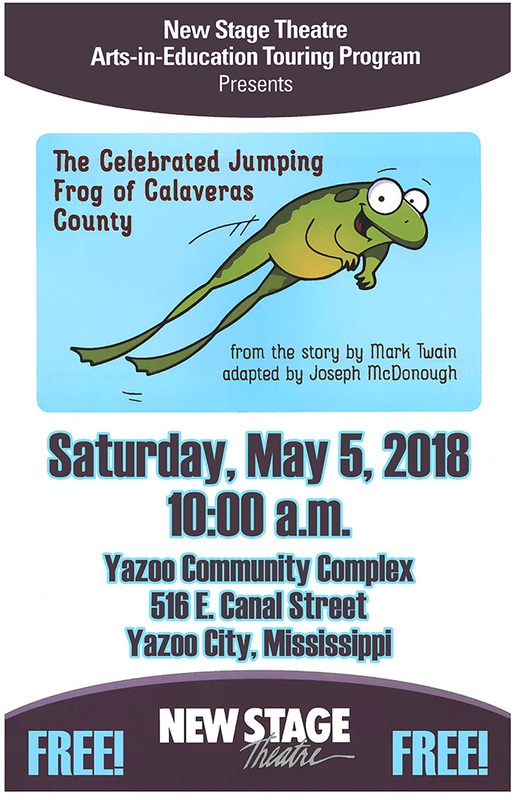 The Junior Auxiliary of Yazoo City in conjunction with the Yazoo Arts Council will present New Stage Theatre Arts-in-Education Touring Program’s production of The Celebrated Jumping Frog of Calaveras County from the story by Mark Twain, adapted by Joseph McDonough, at the Yazoo Community Complex. Admission is Free. For help with planning your trip to Yazoo, please contact the Yazoo County CVB (Visit Yazoo on Facebook, Instagram, and Twitter).